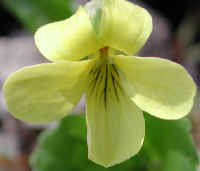 (Yellow Violet (Viola rotundifolia) - 01) There are several species of yellow violets. We believe this one to be the round-leaved yellow violet, because it is the only species of yellow violet that does not have stem leaves. 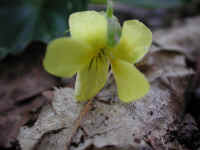 The leaves of the round-leaved yellow violet are roundish and basal. At the time of blooming, the leaves are still unfolding. Later in the season, the leaves will flatten out upon the ground. 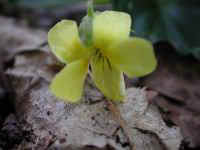 The other characteristic of the round-leaved yellow violet's leaves is their wavy toothed edges. (Yellow Violet (Viola rotundifolia) - 01a) The actual size of the round-leaved yellow violet flower is about 1/2 inch, or slightly less in diameter. It has five petals, two upper and three lower. 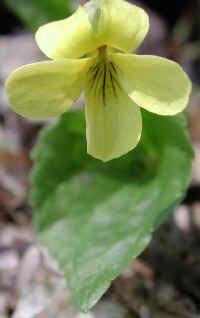 The lower three petals of the round-leaved yellow violet have brown veins, though the central lower petal is more heavily veined. The two lower side petals are also "bearded", the beginnings of which can be seen opposite each other. (Yellow Violet (Viola rotundifolia) - 02) In this enlargement of the round-leaved yellow violet flower we can more clearly see the development of the the bearded projections on the lower side petals. (Yellow Violet (Viola rotundifolia) - 03) We thought the contrast of the newly appearing round-leaved yellow violet sprouting forth from last year's decomposing leaves to be interesting. God's way is to bring forth life from death.